Many fungi damage or even kill plants. But there are also plant-friendly fungi: Most land plants live in close community with arbuscular mycorrhiza fungi (AM fungi) that stimulate their growth. Researchers of the "Molecular Phytopathology" Group of Karlsruhe Institute of Technology (KIT) study the development of this symbiosis. The scientists have now identified a gene that is specifically activated by AM fungi and influences the development of the plant root: The GRAS transcription factor MIG1 stimulates growth of more and larger root cortex cells. This is reported by the researchers in Current Biology (DOI 10.1016/j.cub.2016.07.059). Most land plants live in symbiosis with AM fungi. Both sides profit: The AM fungi help the plants extract nutrients, such as nitrogen, phosphate, and water, from the ground, protect them against pests, and stimulate plant growth by influencing root development. In return, the plants supply the AM fungi with carbohydrates produced by photosynthesis. Symbiosis enhances growth and health of the plants even under adverse conditions of nutrient-depleted soil and stress. Controlled cultivation of plants in symbiosis with arbuscular mycorrhiza fungi might help reduce the amount of fertilizers and pesticides needed and, thus, contribute to sustainable agriculture. But how does the plant make friends with fungi? This question is studied by scientists of the "Molecular Phytopathology" Group headed by Professor Natalia Requena of KIT's Botanical Institute. Their fundamental research focuses on molecular processes associated with symbiosis. 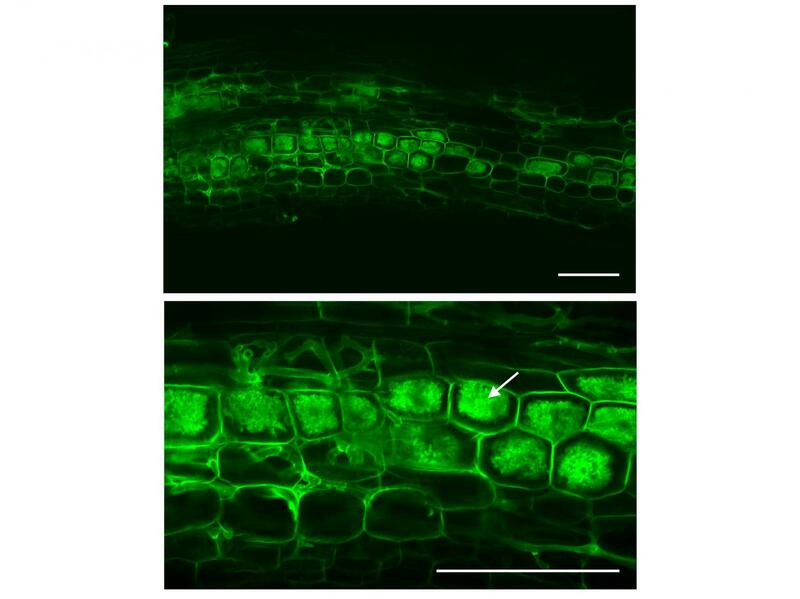 For the stimulation of plant growth by root development, the scientists have identified a plant gene that is activated specifically by the AM fungi – the GRAS transcription factor MIG1. It determines the size of the root cortex cells. Using Medicago truncatula, a snail clover species, KIT scientists studied the role of MIG1. They report their findings in the Current Biology journal. "Development of symbiosis with arbuscular mycorrhiza fungi requires plants to adapt in an extraordinary and controlled way," Professor Natalia Requena explains. "The plant activates its genetic programs for such a symbiosis even before its first physical contact with the fungus as soon as it receives a signaling substance emitted by the fungus." Then, development of symbiosis is mainly controlled by the plant. Settlement of AM fungi on plant roots is restricted to the epidermal tissue and cortex. Hyphae (cellular threads) of the fungus penetrate deep into the cortex and form widely branched structures, so-called arbuscules. The plant forms a specifically synthesized periarbuscular membrane (PAM) to enclose the arbuscules. Plant-specific proteins of the GRAS protein family take over major functions in the regulation of root colonization and the formation of arbuscules. They act as transcription factors that control, i.e. switch on or off, the activity of other genes. The protein RAM1, for instance, enables branching of arbuscules, RAD1 maintains them, and NSP1, NSP2, and DIP1 control the general colonization process. The researchers working in the group of Professor Natalia Requena identified the transcription factor MIG1 (Mycorrhiza Induced GRAS 1). It is expressed most strongly in cells containing arbuscules. MIG1 significantly modifies root cortex development by stimulating growth of more and larger root cortex cells. The overall diameter of the roots increases considerably. Vice versa, downregulation of MIG1 leads to malformed arbuscules.